Sometimes I feel like Sherman doesn’t get enough blog time. He’s the one thing in my life that is consistent. He’s the normal in my crazy life. He doesn’t have many health issues and he’s always there. He always sleeps right outside my bedroom door and he’s always the first to greet me with a wagging tail, a sloppy kiss and happy belly rub. The other night I was playing pool with my husband and Sherman came down and laid against the wall in the pool room. When my game was over I went and sat on the couch and Sherman was next to me. After a little bit I moved over to the bar stool and Sherman once again, was right under my feet. He’s the loyalest dog that I’ve ever had. Sometimes I overlook the fact that Sherman is my constant and that he’s always by my side no matter what, but lately I’ve been trying to pay more attention. 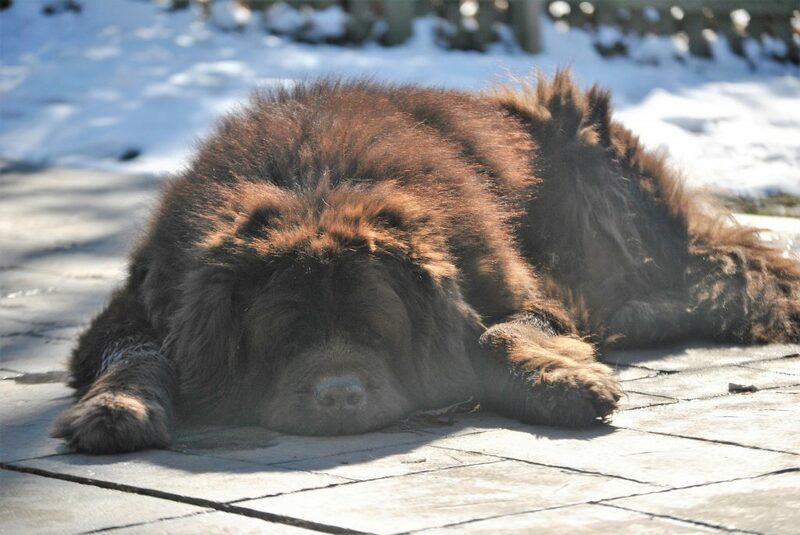 I feel like I know of so many people who have lost their Newfie this past year. I don’t know if it’s because I know more people with Newfies due to social media or if it’s because there was just a HUGE loss this year in our community. Whether they were unexpected losses, losses due to illness or old age, they all seemed sudden to me and each one affected me. The loss of a Newfie is profound. I’m not sure if it’s more profound than losing another type of dog but for me, it’s unexplainable. Every loss that I read about this past year broke my heart but it also taught me to pay more attention, take more pictures, give more belly rubs and to steal all the kisses that I can. It’s so easy for us in our busy lives to step over or walk by our dogs without stopping for a few seconds, a few minutes or even a few hours to say hello. I know I’m guilty of it and since I don’t know how much time I have left with my boys I’m going to do better. This weekend I spent a good part of my Sunday taking pictures of Sherman which isn’t always easy because Sherman isn’t fond of the camera but on this day he was working it, or maybe, he just doesn’t care anymore. Either way I got some good pictures of his handsome self and I caught myself admiring his beauty in between shots. He has a dry nose, a little mass on his toe, arthritis in his hind end, he breathes heavy at times, he has some grey on his muzzle, he takes a lot of naps and he’s moving quite a bit slower than he ever has but medically, he’s good, he’s happy I think and he’s oh so handsome. All that is good. My constant remains steady. We do always wonder what is going on with Sherman as we normally hear about Leroy. Sherman is a super sweet boy. What a sweet, loyal boy. And you’re right, he is very handsome. Everyone deserves a dog like Sherman in their lifetime. I’m glad he’s doing well and posed for some great photos! Love ya Sherman!!!! 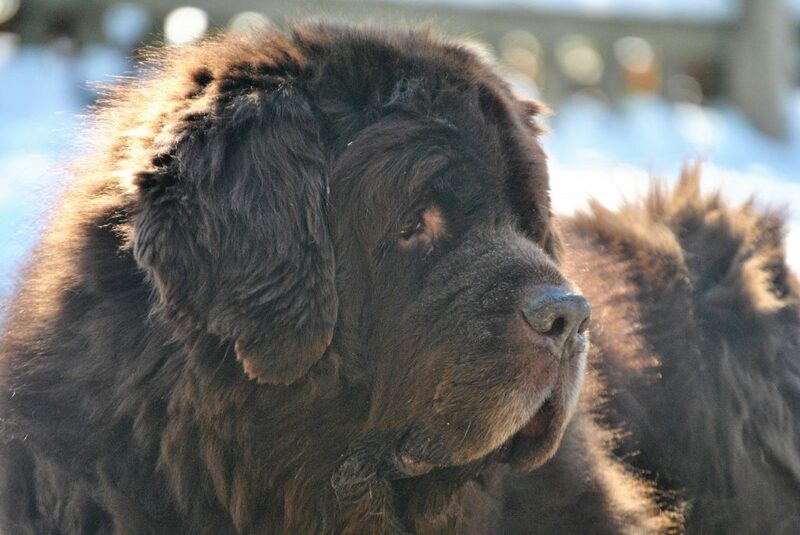 Oh Jen they are not just our pupstars but in many respects they are our hearts and souls, having had different breeds of dogs as a child and young adult and yes I loved them and they loved me but there is something profound about sharing your life with Newfoundlands. You couldn’t be more right Pim! It’s always so hard for me to put into words how these dogs are! Agh, the tears are flowing and yes it does seem like there has been a lot of loss this year, but just imagine this world if we never knew them. I can’t, and don’t want to. 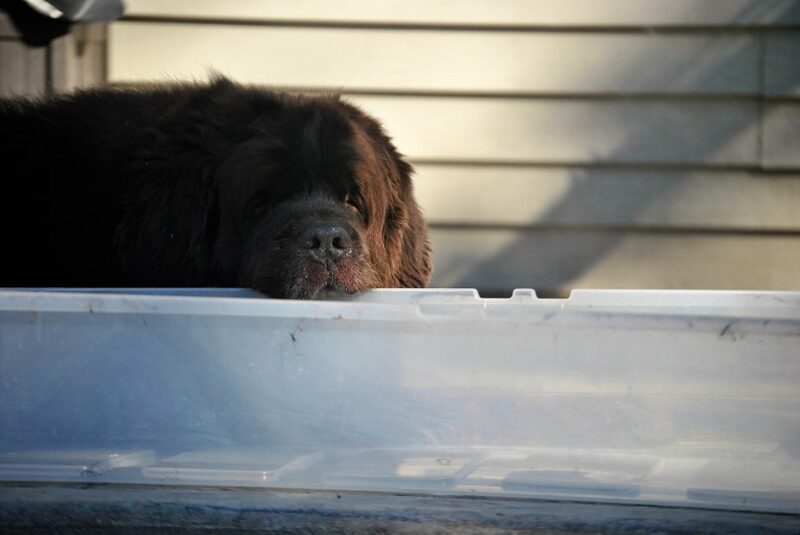 Newfies are so special, intuitive and loyal. I know that I am better for having them in my life and I love seeing so many others showing their love and affection to their families. I have the same worry about Maisie. She’s my steady, my constant companion that I have to lunge over and is so easy. I’ve been trying to give her more one on one time lately, I need her to know that she is special too! I have loved reading about Sherman and Leroy over the years. They are both so handsome and yet so different. Wouldn’t it be fun to see these four browns all together? I’m sure Winn would drive your boys crazy, just as she does Maisie. Big hugs and slobbery kisses from all of us. Well you said exactly what I was trying to say! I always find it so hard to put it into words how these dogs change your life for the better! Thank you! It really is hard to see our pups age, and it’s good to be reminded that time together is precious. Enjoy your Sherman and your Leroy! It is so true! One day they are well the next they can be gone!! 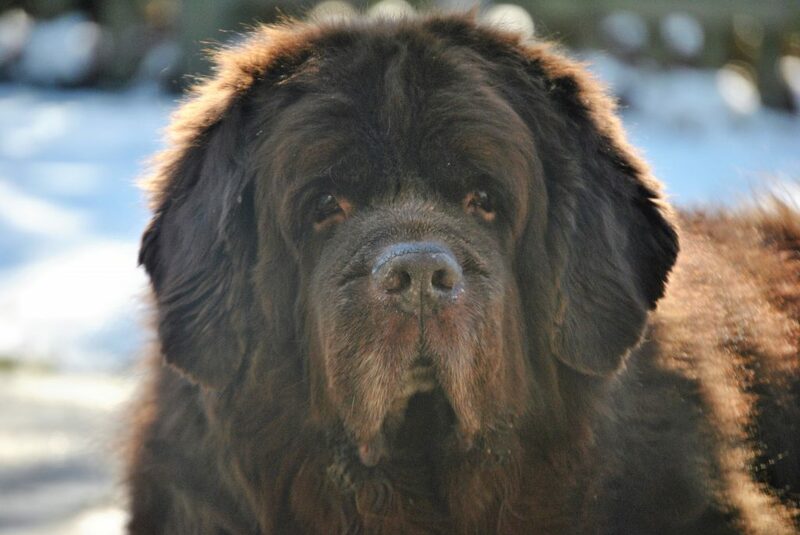 I too have been trying to show extra love to our Newf Nana. She sometimes is just in the background to the other dogs. She too is loyal and just wants to be the #1 dog but she is not assertive and the others pretty much rule. 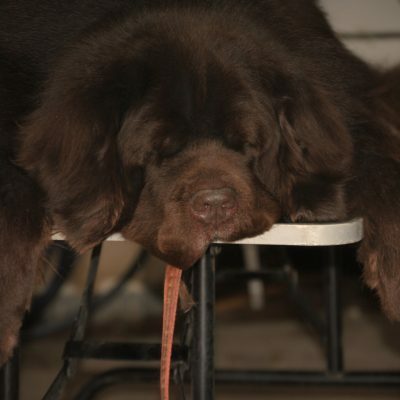 There is nothing like a newf, I know I will miss her badness when she’s gone!! 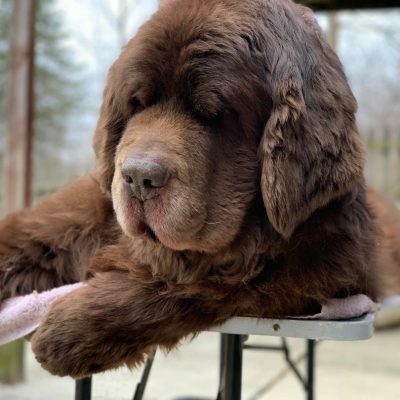 Thanks to you for educating people on newfs! They really are a way of life! Not for the inexperienced dog owner for sure! Thanks for sharing Sherman’s story! He’s so handsome! Thank you! That’s exactly how Sherman is, He doesn’t ask for much expect just to be loved. He isn’t demanding like Leroy is and he is oh so loyal! I just love him to pieces! Aw, Sherman IS a handsome boy! What a sweetie, letting you take those photos! 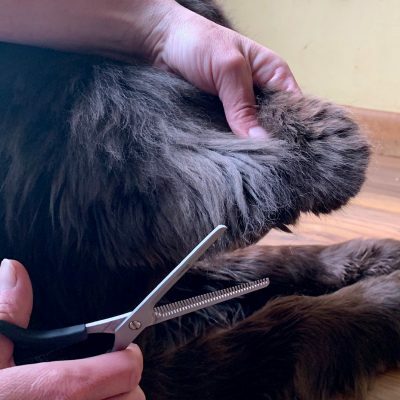 Shadow has become my constant over the years – as Callie had been for all her 11 years – and I’ve made a point of giving her as much one-on-one time as I possibly can these past several months. She’s always there for me when I need a furry shoulder. The very least I can do is show her my love and appreciation in return. Sherman sounds a lot like our Bandit. For the first 7.5 years he’s been our rock…always there, always around keeping an eye on everything and everyone, but not demanding much attention. He’s happy just being nearby. Interesting that we don’t have many pics either as he isn’t much for sitting still in while we try to take a pic. I guess we should just try harder. Now that he has developed health problems, he is handling EVERYTHING like a trooper. Minimal side affects, and he is his old self. Sleeps a lot, always nearby. This stupid cancer will get him, but we’re going to enjoy every day we can. He acts like nothing is wrong, we just need to remember that there is and appreciate all the days we get….